MARATHON, Fla. - U.S. Sen. Marco Rubio, R-Fla., revisited a canal in the Florida Keys Friday that was once known as one of the worst debris-filled canals in Monroe County following Hurricane Irma. 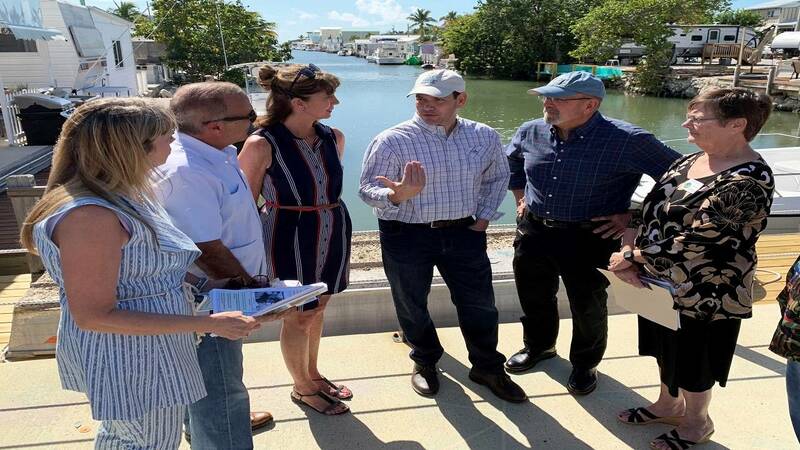 Rubio and other officials from the county, city of Marathon and village of Islamorada visited Canal 242 to see the result of a $49.2 million grant to remove the debris from canals in the county. The canal was once filled with multiple sunken motorhomes and household appliances. "This sure looks a lot better than the last time I was here," Rubio said. "To be able to come back today to see this project ahead of schedule and under budget is amazing, but we still have a lot of work to be done. This is a great example of us all working together to get something positive done." Residents and volunteers in the area repeatedly went out in kayaks to try to clean up the canals before the grant was issued. Canal 242, which is located at 6099 Overseas Highway in Marathon, was the first canal cleaned in a 172-canal marine debris removal grant funded by the Emergency Watershed Protection Program of the U.S. Department of Agriculture’s Natural Resources Conservation Service (NRCS). Monroe County officials said so far, $15.6 million of grant has been used for debris removal and the project is expected to be completed under budget within the 220-day mandated deadline. The project began on Aug. 17, 2018. The county has applied for a NRCS approval for sediment removal with the unused grant funds and is awaiting a decision. "We will continue working in an expeditious and cost-effective way and hope to get additional work approved through NRCS to ensure all of the Florida Keys canals are cleared of marine debris and sediment resulting from Hurricane Irma," said Monroe County Administrator Roman Gastesi. During Friday's visit, Rubio said he wanted to see why some of the canals were denied, as well as push for a deadline extension for some of the canals that are going to take longer to clean. The canals that have been cleaned so far were chosen by officials with NRCS. Marine debris removal in Monroe County is expected to be completed in March. County officials said Marathon and Islamorada have completed its marine debris removal projects.